Loisirs Littéraires au XXe siècle (English: "Literary leasures in the 20th century") is the title of an illustration from the story "The End of Books" by French writer Octave Uzanne and illustrator Albert Robida, a story about a post-literate society in which readers have become 'hearers', consumers of audio books. It was published in the collection Contes pour les bibliophiles (1895). 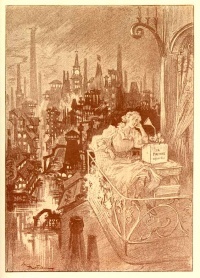 The illustration depicts a female reader of the 20th century, imagined by Robida, who is listening to "12 poètes assortis" (twelve assorted poets) on the balcony overlooking a future city. La Fin des livres (Eng:The End of Books), a story about a post-literate society in which readers have become 'hearers', consumers of audio books. It was published in the collection Contes pour les bibliophiles (1895). from Scribner's Magazine, 16 (1894) pp 221-231. It was in London, about two years ago, that the question of "the end of books" and their transformation into something quite different was agitated in a group of book-lovers, artists, men of science and of learning, on a memorable evening, never to be forgotten by anyone then present. We had met that evening, which happened to be one of the scientific Fridays of the Royal Society, at a lecture given by Sir William Thomson, the eminent English physicist, professor in the University of Glasgow, universally known for the part he took in the laying of the first transatlantic cable. On this Friday evening Sir William had announced to his brilliant audience of savants and men of the world that the end of the terrestrial globe and of the human race was mathematically certain to occur in precisely ten million years. Taking his stand on the theory of Helmholtz, that the sun is a vast sphere in process of cooling, and, by the law of gravity, of shrinking in proportion as it cools, and having estimated the energy of the solar heat as four hundred and seventy-six million horse-power to the superficial square foot of its photo-sphere, Sir William had demonstrated that the radius of the photosphere grows about one-hundredth part shorter every two thousand years, and that it is therefore quite possible to fix the precise hour when its warmth will be insufficient to maintain life on our planet. The great philosopher had surprised us no less by his treatment of the antiquity of the earth, which he showed to be a question of pure mechanics. In the face of geologists and naturalists he gave it a past history of not more than a score of millions of years, and showed that life had awakened upon earth in the very hour of the sun's birth — whatever may have been the origin of this fecundating star, whether the bursting of a pre-existing world or the concentration of nebulae formerly diffused. We had left the Royal Institute deeply moved by the great problems which the learned Glasgow professor had taken such pains to resolve scientifically for the benefit of his audience. With minds in pain, almost crushed by the immensity of the figures with which he had been juggling, we were silently walking home, a group of eight different personalities — philologians, historians, journalists, statisticians, and merely interested men of the world — walking two and two, like creatures half awake, down Albemarle Street and Piccadilly. Edward Lembroke dragged us all into the Junior Athenæum to supper; and the champagne had no sooner limbered our half-numbed brains than it was who should speak first about Sir William Thomson's lecture and the future destiny of humanity — questions interesting above all others and usually as varied as the minds of those who discuss them. James Whittemore discoursed at length upon the intellectual and moral predominance which by the end of the next century the younger continents would have over the older ones. He gave us to understand that the Old World would little by little give up its claim to omnipotence, and America would lead the van in the march of progress. Oceanica, born only yesterday, would develop superbly, throwing off the mask of its ambitions and taking a prominent place in the universal concert of the nations. Africa, he added, that continent ever explored and ever mysterious, where at a moment's warning countries of thousands of square miles are discovered — Africa so painfully won to civilization, does not seem called to play an eminent part, notwithstanding her immense reservoir of men. She will be the granary of other continents; upon her soil various invading peoples will by turns play dramas of small importance; hordes of men will meet and clash and fight and die there in greedy desire to possess this still virgin soil, but civilization and progress will gain a footing only after thousands of years, when the prosperity of the United States, having reached its zenith, will be drawing toward its decline, and when new and fateful evolutions shall have assigned a new habitat to the new products of human genius. Julius Pollock, gentle vegetarian and learned naturalist, usually a silent boon companion, amused himself by imagining the effect upon human customs of the success of certain interesting chemical experiments transforming the conditions of our social life. Nutriment will then be accurately portioned out in the form of powders, syrups, pellets, and biscuits, everything reduced to the smallest possible bulk. No more bakers, butchers, or wine-merchants then; no more restaurants or grocers; only a few druggists, and everyone thenceforth free, happy, all wants provided for at the cost of a few cents; hunger blotted out from the roll of human woes. Especially the world would cease to be the unclean slaughter-house of peaceful creatures, a gruesome larder set forth for the gratification of gluttony, and would become a fair garden, sacred to hygiene and the pleasure of the eye. Life would be respected both in beasts and in plants, and over the entrance to this Paradise Regained, become a colossal museum of the creatures of God, might be written, "Look, but do not touch the exhibits." "That is all Utopia," cried John Pool, the humorist. "The animals, my dear Pollock, will not follow your chemical programme, but will continue to devour one another according to the mysterious laws of creation. The fly will always be the vulture of the microbe, the most harmless bird the eagle of the fly; the wolf will keep on presenting himself with legs of lamb, and the peaceful sheep will continue, as in the past, to be 'the tiger of the grass.' Let us follow the general law, and while awaiting our turn to be devoured, let us devour." "Is what we call modern art really an art?" he cried. Do not the artists without vocation, who practise it fairly well, with a show of talent, sufficiently prove it to be a trade, in which soul is as much lacking as sight? Can we give the name of works of art to five-sixths of the pictures and statues which litter up our annual exhibitions? Can we indeed find many painters or sculptors who are truly original creators? "We see nothing but copies of all sorts; copies of Old Masters accommodated to modern taste, adaptations ever false of epochs forever gone by, trite copies of nature as seen with a photographer’s eye, insipid patchwork imitations of frightful war subjects such as have made Meissonier famous; nothing new, nothing that takes us out of our own humanity, nothing that transports us elsewhere. And yet it is the duty of art, whether by music or poetry or painting, at any cost to carry us beyond ourselves, that for an instant at least we may hover in that sphere of the unreal where we may take the idealistic aëropathy cure. "I verily believe," Blackcross went on, "that the hour is at hand when the whole universe will find itself saturated with pictures, dull landscapes, mythological figures, historic episodes, still life, and all other works soever; the very negroes will have no more of them. In that divine moment, that avenging instant, painting will die of inanition; governments will perhaps at last perceive their dense folly in not having systematically discouraged the arts as the only practical way of protecting and exalting them. In a few countries, resolved upon a general reform, the ideas of the iconoclasts will prevail; museums will be burned down, that they may no longer influence budding genius; the commonplace in all its forms will be tabooed; that is to say, the reproduction of any tangible thing, of anything that we see, of anything that illustrations, photography, or the theatre can sufficiently well express; and art, at last given back to itself, will be raised aloft into the upper regions of revery, seeking there its appropriate figures and symbols. "Art will then be a closed aristocracy; its production will be rare, mystic, devout, loftily personal. It will perhaps command at most ten or twelve apostles in each generation, with something like a hundred ardent disciples to admire and encourage them. Beyond the realm of this abstract art photography in colors, photogravure, illustrated books, will suffice for the gratification of the masses; but exhibitions being interdicted, landscape painters being ruined by photopainting, historical subjects being for the future represented by suggestive models which at the pleasure of the operator shall express pain, surprise, dejection, terror, or death, all photopainting, in short, having become simply a question of a vast diversity of mechanical processes, a branch of commerce, there will be no painters in the twenty-first century, but instead of them a few holy men, true fakirs of the ideal and the beautiful, who amidst the silence and incomprehension of the masses will produce masterpieces at last worthy of the name." Slowly and with minute detail Arthur Blackcross worked out his vision of the future, not without success, for our recent visit to the Royal Academy had been hardly more cheering than those paid to our two great national bazaars of painting in Paris, at the Champ de Mars and the Champs Elysées. For a little while we discussed the general ideas of our symbolical friend, and it was the founder of the School of the Æsthetes of To-morrow himself who changed the course of conversation by an abrupt appeal to me for my literary views and opinions. "Come, my worthy Bibliophile, it is your turn to speak. Tell us how it will be with letters, with literature and books a hundred years hence! Since we are remodelling the society of the future to suit ourselves, this evening, each of us throwing a ray of light into the darkness of the centuries to come, I pray you illuminate certain horizons with a beam from your revolving light." "What is my view of the destiny of books, my dear friends? The question is interesting, and fires me all the more because in good faith I never put it to myself before this hour. "If by books you are to be understood as referring to our innumerable collections of paper, printed, sewed, and bound in a cover announcing the title of the work, I own to you frankly that I do not believe (and the progress of electricity and modern mechanism forbids me to believe) that Gutenberg's invention can do otherwise than sooner or later fall into desuetude as a means of current interpretation of our mental products. "Printing, which Rivarol so judiciously called the artillery of thought, and of which Luther said that it is the last and best gift by which God advances the things of the Gospel — printing, which has changed the destiny of Europe, and which, especially during the last two centuries, has governed opinion through the book, the pamphlet, and the newspaper — printing, which since 1436 has reigned despotically over the mind of man, is, in my opinion, threatened with death by the various devices for registering sound which have lately been invented, and which little by little will go on to perfection. "Notwithstanding the enormous progress which has gradually been made in the printing-press, in spite of the already existing composing-machines, easy to run, and furnishing new characters freshly moulded in movable matrices, it still appears to me that the art in which Faust and Scheffer, Estienne and Vascosa, Aldus Manutius and Nicholas Jenson successively excelled, has attained its acme of perfection, and that our grand-children will no longer trust their works to this somewhat antiquated process, now become very easy to replace by phonography, which is yet in its initial stage, and of which we have much to hope." There was an uproar of interruption and inquiry among my hearers; astonished "oh's!" ironical "ah's!" doubtful "eh! eh's!" and mingled with a deepening murmur of denial such phrases as "But that's impossible!" "What do you mean by that?" I had some difficulty in restoring silence enough to permit me to resume my remarks and explain myself more at length. "Let me tell you that the ideas which I am about to open to you are the less affirmative that they are not ripened by reflection. I serve them up to you just as they come to me, with an appearance of paradox. However, there is nothing like a paradox for containing truth; the wildest paradoxes of the philosophers of the eighteenth century are today already partly realized. "I take my stand, therefore, upon this incontestable fact, that the man of leisure becomes daily more reluctant to undergo fatigue, that he eagerly seeks for what he calls the comfortable, that is to say for every means of sparing himself the play and the waste of the organs. You will surely agree with me that reading, as we practise it today, soon brings on great weariness; for not only does it require of the brain a sustained attention which consumes a large proportion of the cerebral phosphates, but it also forces our bodies into various fatiguing attitudes. If we are reading one of our great newspapers it constrains us to acquire a certain dexterity in the art of turning and folding the sheets; if we hold the paper wide open it is not long before the muscles of tension are overtaxed, and finally, if we address ourselves to the book, the necessity of cutting the leaves and turning them one after another, ends by producing an enervated condition very distressing in the long run. "The art of being moved by the wit, the gaiety, and the thought of others must soon demand greater facilities. I believe, then, in the success of everything which will favor and encourage the indolence and selfishness of men; the elevator has done away with the toilsome climbing of stairs; phonography will probably be the destruction of printing. Our eyes are made to see and reflect the beauties of nature, and not to wear themselves out in the reading of texts; they have been too long abused, and I like to fancy that some one will soon discover the need there is that they should be relieved by laying a greater burden upon our ears. This will be to establish an equitable compensation in our general physical economy. "Very well, very well," cried my attentive companions, "but the practical side of this? How do you suppose that we shall succeed in making phonographs at once portable enough, light enough, and sufficiently resisting to register long romances which, at present, contain four or five hundred pages, without getting out of order; upon what cylinders of hardened wax will you stereotype the articles and news items of journalism; finally, with the aid of what sort of piles will you generate the electric motors of your future phonograph? All this is to be explained, and it does not appear to us easy to make it practical." "Nevertheless it will all be done," I replied. "There will be registering cylinders as light as celluloid penholders, capable of containing five or six hundred words and working upon very tenuous axles, and occupying not more than five square inches all the vibrations of the voice will be reproduced in them; we shall attain to perfection in this apparatus as surely as we have obtained precision in the smallest and most ornamental watches. "As to the electricity, that will often be found in the individual himself. Each will work his pocket apparatus by a fluent current ingeniously set in action; the whole system may be kept in a simple opera-glass case, and suspended by a strap from the shoulder. "As for the book, or let us rather say, for by that time books 'will have lived,' as for the novel, or the storyograph, the author will become his own publisher. To avoid imitations and counterfeits he will be obliged, first of all, to go to the Patent-Office, there to deposit his voice, and register its lowest and highest notes, giving all the counter-hearings necessary for the recognition of any imitation of his deposit. The Government will realize great profits by these patents. "Having thus made himself right with the law, the author will talk his work, fixing it upon registering cylinders. He will himself put these patented cylinders on sale; they will be delivered in cases for the consumption of hearers. "Men of letters will not be called Writers in the time soon to be, but rather, Narrators. Little by little the taste for style and for pompously decorated phrases will die away, but the art of utterance will take on unheard-of importance. Certain Narrators will be sought out for their fine address, their contagious sympathy, their thrilling warmth, and the perfect accuracy, the fine punctuation of their voice. The Author Depositing his Voice at the Patent-Office to Prevent Counterfeiting. "The ladies will no longer say in speaking of a successful author, 'What a charming writer!' All shuddering with emotion, they will sigh, 'Ah, how this "Teller's" voice thrills you, charms you, moves you! What adorable low tones, what heart-rending accents of love! When you hear his voice you are fairly exhausted with emotion. There is no ravisher of the ear like him! My friend James Whittemore interrupted me. "And what will become of the libraries, dear friend, and of the books?" "The Narrators, blithe authors that they will be, will relate the current events of current life, will make a study of rendering the sounds that accompany — sometimes with ironical effect, like an orchestration of Nature — the exchange of commonplace conversation, the joyful exclamations of assembled crowds, the dialects of strange people. The evocations of the Marseillais or the Auvergnats will amuse the French as the jargon of the Irishman and the Westerner will excite the laughter of Americans of the East. "Authors who are not sensitive to vocal harmonies, or who lack the flexibility of voice necessary to a fine utterance, will avail themselves of the services of hired actors or singers to warehouse their work in the accommodating cylinder. We have to-day our secretaries and copyists; there will then be 'phonists' and 'clamists' to interpret utterances dictated by the creator of literature. "Hearers will not regret the time The Binding of the Future. when they were readers; with eyes unwearied, with countenances refreshed, their air of careless freedom will witness to the benefits of the contemplative life. Stretched upon sofas or cradled in rocking-chairs, they will enjoy in silence the marvellous adventures which the flexible tube will conduct to ears dilated with interest. A Voice from Scotland. "At home, walking, sightseeing, these fortunate hearers will experience the ineffable delight of reconciling hygiene with instruction ; of nourishing their minds while exercising their muscles for there will be pocket phono-operagraphs, for use during excursions among Alpine mountains or in the cafions of the Colorado." "Your dream is most aristocratic," interposed Julius Pollock, the humanitarian; "the future will be more democratic. I should like to see the people more favored." "They will be, my gentle poet," I replied, gaily, going on to develop my vision of the future; "nothing will be lacking for them on this head; they may intoxicate themselves on literature as on pure water, and as cheaply, too, for there will then be fountains of literature in the streets as there are now hydrants. "At every open place in the city little buildings will be erected, with hearing tubes corresponding to certain works hung all around for the benefit of the studious passer-by. They will be easily worked by the mere pressure of a button. On the other side, a sort of automatic book-dealer, set in motion by a nickel in the slot, will for this trifling sum give the works of Dickens, Dumas père, or Longfellow, on long rolls all prepared for home consumption. Manufacturing Books. "I go even farther: the author who desires personally to bring his work to the public knowledge after the fashion of the trouvères of the Middle Ages, carrying them about from house to house, may draw a modest but always remunerative profit by renting to all the inmates of the same apartment-house a sort of portable organ, which may be slung over the shoulder, composed of an infinite number of small tubes connected with his auditory shop, by means of which his works may be wafted through the open windows to the ears of such lodgers as may desire amusement in a moment of leisure, or cheer in an hour of solitude. Phonographic Literature for the Promenade. "People of small means will not be ruined, you must admit, by a tax of four or five cents for an hour's 'hearing,' and the fees of the wandering author will be relatively important by the multiplicity of hearings furnished to each house in the same quarter. "Is this all? By no means. The phonography of the future will be at the service of our grandchildren on all the occasions of life. Every restaurant-table will be provided with its phonographic collection; the public carriages, the waiting-rooms, the state - rooms of steamers, the halls and chambers of hotels will contain phonographotecks for the use of travellers. The railways will replace the parlor car by a sort of Pullman Circulating Library, which will cause travellers to forget the weariness of the way while leaving their eyes free to admire the landscapes through which they are passing. The Automatic Library. "I shall not undertake to enter into the technical details of the methods of operating these new interpreters of human thought, these multiplicators of human speech; but rest assured that books will be forsaken by all the dwellers upon this globe, and printing will absolutely pass out of use except for the service it may still be able to render to commerce and private relations; and even there the writing-machine, by that time fully developed, will probably suffice for all needs. "Have no fear; it will follow the general law, for public curiosity will go on forever increasing, and men will soon be dissatisfied with printed interviews more or less correctly reported. They will insist upon hearing the interviewee, upon listening to the discourse of the fashionable orator, hearing the actual song, the very voice of the diva whose first appearance was made over-night. What but the phonographic journal can give them all this? The voices of the whole world will be gathered up in the celluloid rolls which the post will bring morning by morning to the subscribing hearers. Valets and ladies'-maids will soon learn how to put them in place, the axle of the cylinder upon the two supports of the motor, and will carry them to master or mistress at the hour of awakening. Lying soft and warm upon their pillow they may hear it all, as if in a dream — foreign telegrams, financial news, humorous articles, the news of the day. The Author Exploiting his Own Works. "Journalism will naturally be transformed; the highest situations will be reserved for robust young men with strong, resonant voices, trained rather in the art of enunciation than in the search for words or the turn of phrases; literary mandarinism will disappear, literators will gain only an infinitely small number of hearers, for the important point will be to be quickly informed in a few words without comment. "In all newspaper offices there will be Speaking Halls where the editors will record in a clear voice the news received by telephonic despatch; these will be immediately registered by an ingenious apparatus arranged in the acoustic receiver; the cylinders thus obtained will be stereotyped in great numbers and posted in small boxes before three o'clock in the morning, except where by agreement with the telephone company the hearing of the newspaper is arranged for by private lines to subscribers' houses, as is already the case with theatrophones." William Blackeross, the amiable critic and æsthete, who up to this point had kindly listened without interrupting my flights of fancy, now deemed it the proper moment for asking a few questions. "Permit me to inquire," he said, "how you will make good the want of illustrations? Man is always an over-grown baby, and he will always ask for pictures and take pleasure in the representation of things which he imagines or has heard of from others." "The kinetograph will be the illustrator of daily life ; not only shall we see it operating in its case, but by a system of lenses and reflectors all the figures in action which it will present in photochromo may be projected upon large white screens in our own homes. Scenes described in works of fiction and romances of adventure will be imitated by appropriately dressed figurants and immediately recorded. We shall also have, by way of supplement to the daily phonographic journal, a series of illustrations of the day, slices of active life, so to speak, fresh cut from the actual. We shall see the new pieces and the actors at the theatre, as easily as we may already hear them, in our own homes; we shall have the portrait, and, better still, the very play of countenance, of famous men, criminals, beautiful women. It will not be art, it is true, but at least it will be life, natural under all its make-up, clear, precise, and sometimes even cruel. "It is evident," I said, in closing this too vague sketch of the intellectual life of To-morrow, "that in all this there will be sombre features now unforeseen. Just as oculists have multiplied since the invention of journalism, so with the phonography yet to be, the aurists will begin to abound. They will find a way to note all the sensibilities of the ear, and to discover names of more new auricular maladies than will really exist ; but no progress has ever been made without changing the place of some of our ills. "Either the books must go, or they must swallow us up. I calculate that, take the whole world over, from eighty to one hundred thousand books appear every year; at an average of a thousand copies, this makes more than a hundred millions of books, the majority of which contain only the wildest extravagances or the most chimerical follies, and propagate only prejudice and error. Our social condition forces us to hear many stupid things every day. A few more or less do not amount to very great suffering in the end; but what happiness not to be obliged to read them, and to be able at last to close our eyes upon the annihilation of printed things!" Impending Maladies of the Ear. Robert Coover. "The End of Books," New York Times, June 21, 1992. Unless indicated otherwise, the text in this article is either based on Wikipedia article "The End of Books" or another language Wikipedia page thereof used under the terms of the GNU Free Documentation License; or on original research by Jahsonic and friends. See Art and Popular Culture's copyright notice. This page was last modified 06:47, 4 October 2013.